Confused by the blank discs marked as CMC Pro - Powered by TY instead of JVC or Taiyo Yuden? Let us explain. Taiyo Yuden has historically been the most reliable name in blank CD and blank DVD products, and quality conscious customers have sought that name for years. A few years back, Taiyo went and shook all that up. Here's the scoop: In 2008, Taiyo Yuden purchased JVC's media group, and they became one and the same, taking advantage of JVC's royalty deals and brand recognition. There was no change in manufacturing. 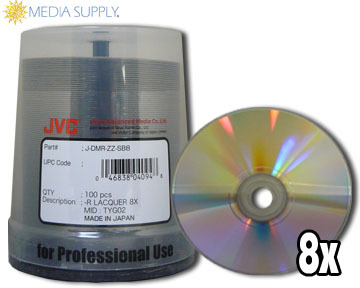 Taiyo Yuden still made the discs at its factory in Japan, but the part numbers and labeling changed to reflect the JVC brand. Fast forward seven years to 2015, when Taiyo Yuden announced that it would stop production of all optical media products at the end of the year. CMC, a well-established optical media manufacturer, recognized an opportunity, and quickly moved to acquire the Taiyo Yuden technology that made JVC/TY the most trusted name in the business. Under the guidance of Taiyo Yuden engineers, CMC built specialized production lines, dedicated to producing its CMC Pro - Powered by TY line of premium blank discs. CMC manufactures CMC Pro using the exact same processes, raw materials, specifications and strict quality standards established by Taiyo Yuden. 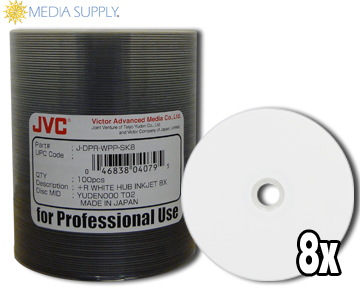 In addition to its dedication to maintain Taiyo Yuden/JVC quality, CMC also committed to producing all JVC/TY SKUs, ensuring that professionals can continue to get the formats and print surfaces required for their specific applications. In a nutshell, that's the story of how Taiyo Yuden became JVC/Taiyo Yuden, which is now CMC Pro - Powered by TY Technology. Whatever you call them, at the end of the day, you're getting a great blank disc. Please feel free to contact us with any questions! Taiyo Yuden was the company that pioneered recordable CD technology (along with Sony). By employing TY's proven technology, CMC Pro offers professional grade CD-Rs widely considered the best quality with the highest reliability and consistency in the recordable media industry. CMC Pro CD-Rs outperform the competition in recording accuracy and superior durability in a wide variety of data and audio applications. It all comes down to how much you value your customers and your time. If you have time to go through each disc to verify that all your copies are good, and you don't have much concern about whether your recorded disc holds up well, then CMC Pro may not be for you. CMC Pro - Powered by TY blank DVDs hold 4.7GB of data and also offer the same quality and reliability found in CMC Pro CD-Rs. Taiyo Yuden set the industry standard for low fallout during recording, high print quality, and low failure in customer drives and players, and CMC Pro continues this tradition of excellence. Like the CMC Pro CD-Rs, these are the standard for print quality, low-error recording, and playback in just about any drive out there. How can I tell if I have fake or real CMC Pro - Powered by TY? This isn't nearly as difficult as it used to be. Since CMC acquired Taiyo Yuden's technology, all CMC Pro - Powered by TY products' packaging (even including Valueline discs) are marked with the CMC Pro logo, a description and barcode. There are websites out there offering premium CMC Pro CDs and DVDs that are not authentic. If you’re not familiar with how a CMC Pro or Taiyo Yuden disc looks or how they are packaged, you could be paying for premium discs and getting a lesser product. Look for the CMC Pro - Powered by TY part number. You can verify these part numbers against the item details on Media Supply's product pages. You can verify a disc’s manufacturer by using a Disc Identifier software. These are easy to use and download. A nice little application is DVDInfoPro. You can check out our chart below for information on some our our most popular CMC Pro - Powered by TY products.